Published on November 9, 2016 in Living History. 6 Comments Tags: 20th century, election, immigrant, italian, lower east side, new york city, vegan, vegetarian. Bread, toast, or Italian cookies. For children bread and milk or oatmeal and milk. The coffee is made strong but is served with hot milk–the cup half or two thirds filled with milk before coffee is poured in. Very often nothing is eaten with the coffee. I’m not a coffee drinker, so I opted for chocolate this morning. Although who knows, maybe this week will change me and I’ll take up the vice of coffee. I used to think my aversion to bitter flavors, like coffee, was just a me not trying hard enough to like it–but after I listened to a recent episode of the podcast Gastropod, I realized I might have a genetic aversion to bitter tastes. I had the chocolate in my house anyways. The hot cocoa for breakfast thing is something the Americans would have pushed; in the 19th century, hot chocolate was seen as a nutritious healthy drink, especially for children. I think it’s a remnant of an older idea from when chocolate was expensive and rare; it was thought something that expensive and rare must have healthful, medicinal properties. Additionally, nutritionists were also really pushing milk in the early 19th century. 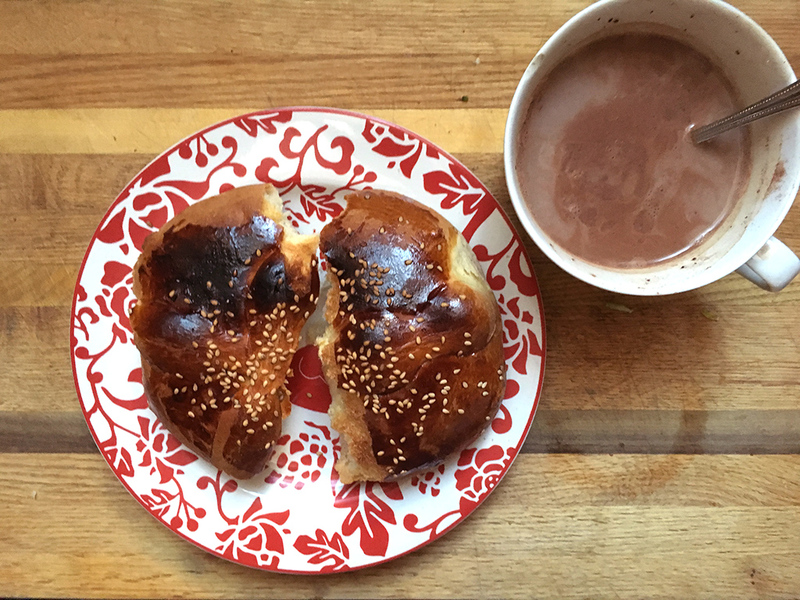 I had my cocoa with a toasted roll, which, yes, is actually a Pan de Muerte–a sweet bread eaten for the Day of the Dead in Mexico (and Mexican neighborhoods in America). I had it in the apartment, I hadn’t gone shopping for this project yet, and it was a little old and dried out. So toasted ,it worked as an fine substitute for an Italian roll. Waste not want not. Breakfast wasn’t really great tho–all those carbs, I felt both full and hungry, which was a barfy feeling–and starving an hour later. After breakfast, I went to vote. My polling place is on Hester Street, which runs east-west through Manhattan, through neighborhoods that were formerly Jewish and Italian, a century ago. Today, I heard English, Spanish and Mandarin spoken in my polling place. I wept with joy when I cast my vote for the first woman president. Stew of spinach, lentils and onions. We had an awesome meal that took me an hour to prepare start to finish, which really made me happy. Efficient and delicious. 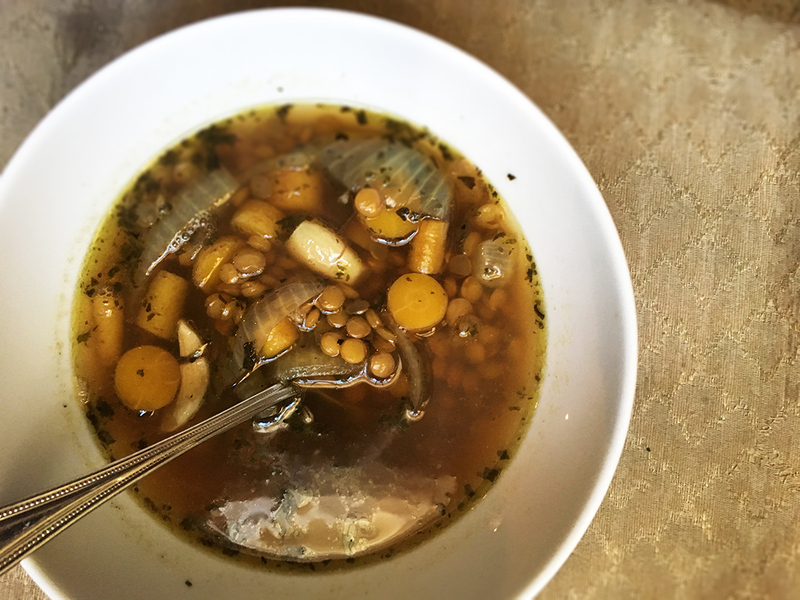 The lentil soup recipe came from Maria Gentile’s 1919 Italian Cookbook. I even made my own stock–I keep a zip bag of vegetable odd and ends in my freezer. When the gallon bag is full, I put it in a pot, cover it in water, bring it to a boil, then let it simmer for 20 minutes. Done. After I strained the stock, I pulled out two carrots I had thrown in there, now cooked, and sliced them and added them to a large saucepan along with 1/4 of a white onion, 4 garlic cloves, salt, pepper, and dried parsley. I meant to throw some kale in there–instead of spinach, because I had it on hand–but Jill showed up, and I got distracted by the baby and I forgot. So when the veggies browned, I put the homemade stock over top, added a cup of lentils, and simmered about 20 minutes until the lentils were tender. 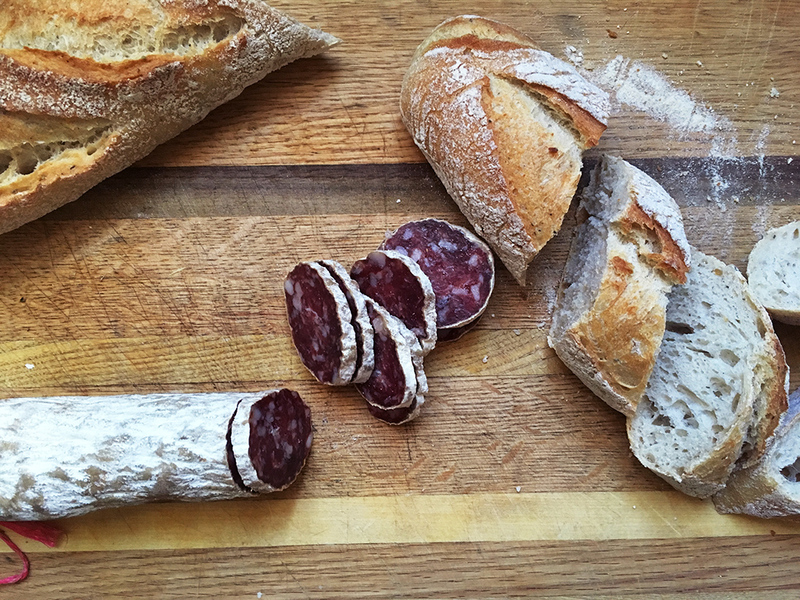 We enjoyed it with hunks of fresh bread and a funky salami that Jill had brought from Eataly, and Italian specialty superstore in NYC. For dessert, I had sliced up two Fuji apples and put them in ramekins with a little water, a tablespoon of brown sugar, a pat of butter, and a sprinkle of a “pie spice” blend. 30 minutes in the over at 375 degrees, and that was it. I was much happier with lunch than breakfast! 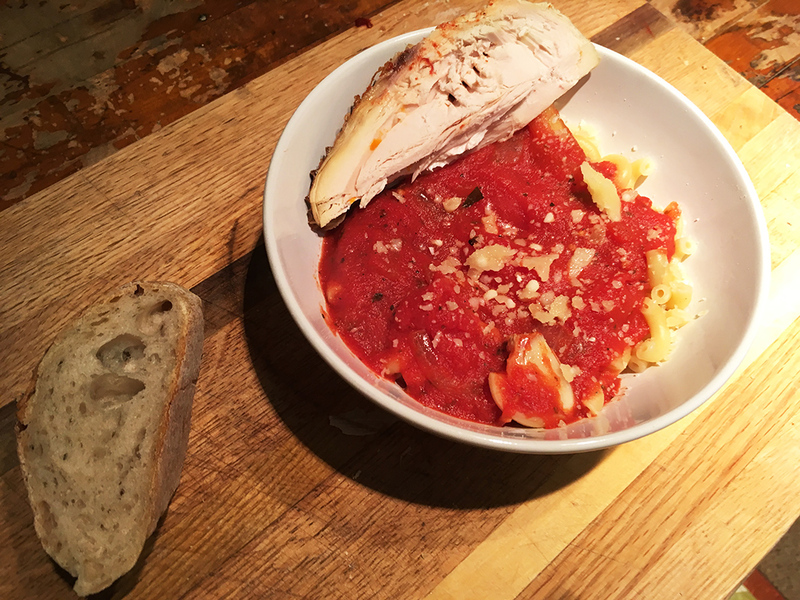 I was warm, satisfied–and these simple, quick foods were totally delicious. Meat (left over from Sunday). I made a big pot of this 1919 recipe for tomato sauce to last me the week. I used more onion and garlic than the recipe recommended, plus celery, bay leaves, and dried parsley. I browned the vegetables with oil, salt and fresh cracked pepper, then dumped an enormous can of San Marzano tomatoes and a couple scoops of tomato paste, too. I love that the recipe tells Americans “Catsup and concentrated tomato soup do not make satisfactory subsitutes as they are too sweet in flavor.” You got that right. Gross. The sauce turned out ok, not as flavorful as I would have liked, so I’ll search for ways to adjust it this week. For tonight’s “macaroni,” I decided to use actual macaroni, dried and boxed. And I actually did have meat left over from Sunday, parts of a roast chicken, that I added to my meal. Dinner, again, was really quick and easy to prepare, and it tasted good and made me feel good. Way to go Italians! I forgot to pick up a bottle of wine to drink with dinner, so I bought it on my way out to watch the election results with friends in Brooklyn. I hoped for a historic day, and for our future as an inclusive country. I did not get that day. As an entrepreneur, I am afraid my business will collapse, along with the economy. As a sufferer of a chronic health issue, I am afraid I will lose my healthcare, which I purchased under the affordable care act. As a woman and an abuse survivor, I am afraid I will be sexually assaulted, because a man will empowered to do so in this permissive climate. As an advocate for immigrants and religious freedom and those that are disenfranchised, I am afraid for my friends who are black, Hispanic, and Muslim. As a human, I am afraid for my friends who are LGBTQ. I am afraid we won’t be able to protect each other. I do not know if I will be continuing this experiment this week. First, thank you for this. We had a friend who grew up Italian (her parents were immigrants) in Providence, RI, during the Depression. She gave me her recipe for “Depression Cake” and told stories of how her family made the pasta and spread it out to dry over a clean sheet on the bed. They had tomatoes from their garden, and if one of the older kids had made enough money that week, they had a bit of meat on Sunday. I like hearing about your experiences, this week in particular. Second, here is a link to my blog, Wheat Wanderings (or Wheatavore): http://wheatwanderings.blogspot.com/. I am working on a book about wheat, and much of what you publish is of great interest to me. I hope that you continue with this Italian discussion, in particular. Third, yes, it is a historic day. For me, for the moment, the best set of responses is to offer each other sympathy, a space for grieving, and assurance that we will make an even greater effort to be here for each other and our sisters and brothers, and our kids and elders. Thank you Teri–for both sharing your experience, and for your message of solidarity. I sincerely appreciate it. I’d love to see that depression cake recipe if you still have it! Please continue the experiment if you can. I am finding it very interesting, but as someone also struggling to come to grips with my feelings about the election results I understand if you feel you need a break. My husband too was so upset last night he couldn’t sleep, when I suggested he call in sick to take the day off to recover, he turned to me with the most determined look on his face I’ve ever seen & said. If I give up, they win. He was going into his very Trump supporter filled workplace (we live in a red state) and he was going to to keep on representing the other point of view. Don’t give them the satisfaction of making you give up. Remember despite the result the majority of people don’t feel the way the haters do, not everyone is full of hate hell almost 45% of voters didn’t even care enough to turn out to vote. Hillary won the popular vote. Trust in the good in most people & we can all get through this. Thank you Samantha–thank you for reaching out and your encouragement. I’m spending a lot of time thinking about how I can do my job better, and be a better voice for the disenfranchised. I completely understand if you feel like you can’t complete the experience this week. I think everyone, myself included, is sort of figuring out how to come out of this as whole as possible. I will say, when I saw the blog post today, I felt this intense happiness and relief! I always love these experience for their thorough research and unique surprises. I saved reading it until now because I wanted to go to bed thinking about homemade pasta and savory tomato sauces. The escape into a different time and place was so appreciated during this difficult adjustment. Thanks, Mari – I had hoped at least I could write to provide some escape for my readers. It’s just been hard to find the motivation–and to not feel like my work is pointless. I appreciate you reaching out and expressing yourself here.